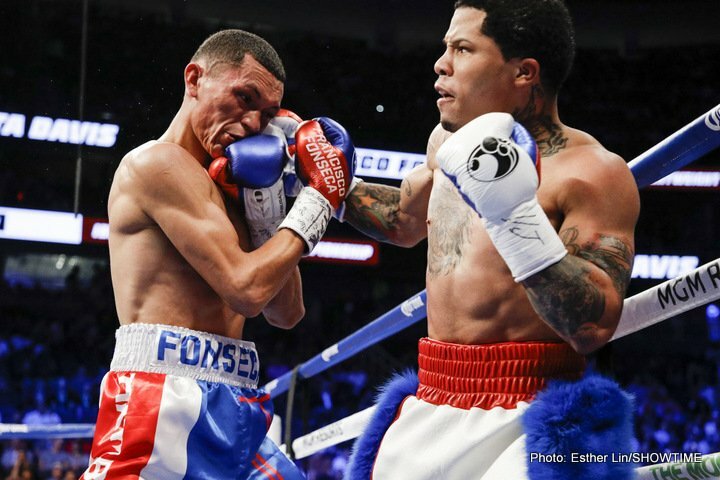 Ring News 24Boxing NewsWhat Are Jesus Cuellar’s Chances Of Pulling An Upset vs. Gervonta Davis? On Saturday night, April 21, undefeated former IBF junior lightweight champion Gervonta Davis (19-0, 18 KO’s) will face off with former featherweight champion Jesus Cuellar (28-2, 21 KO’s). The match takes place from the Barclays Center in Brooklyn, New York and will be aired live on SHOWTIME on the Adrien Broner vs. Jessie Vargas undercard. Davis had a very eventful 2017 that saw him win the IBF junior lightweight title in January vs. Jose Pedraza, then travel overseas to stop Liam Walsh in London in his first defense, then later lose the same belt on the scales, as he failed to make weight ahead of his TKO victory over Francisco Fonseca this past August. Davis now looks to reclaim a title, as he will be vying for the WBA junior lightweight title vs. Cuellar. On paper, this looks like a big edge for Davis, as Cuellar hasn’t fought since his December 2016 loss to Abner Mares, and is now 32 years old. Cuellar did great for himself while at featherweight, having defeated the likes of Rico Ramos, Vic Darchinyan, Juan Manuel Lopez, Claudio Marrero, Ruben Tamayo, and Jose Oquendo during a run as interim/full WBA champion. But the southpaw from Argentina hasn’t seen a fighter quite like Davis before. Davis burst onto the scene a few years back, as he began garnering crazy exposure while temporarily relocating his training bases from Baltimore to Las Vegas as he trained under the watchful eye of the man who would later sign him to his promotional company, Floyd Mayweather. What Mayweather saw in Davis is what others saw, a young fighter (Davis is 23 now) with great power, athleticism, speed, and pedigree. Davis performed very well while in Las Vegas, from his intense sparring to collecting victories prior to his title defense. Cuellar’s career, meanwhile, moved in the other direction, as he has suffered inactivity in the wake of having been one of the sport’s most active champions years prior. If there is one thing Cuellar does have, it is championship experience and some great years honing his craft under the Robert Garcia Boxing Academy. Davis, meanwhile, is on the verge of being a superstar, as evidenced by his huge following on social media, and may find it hard to focus with all the fame and cameras around him. Such could have been the reason he wasn’t able to make weight in his last bout. If there is one fight that you can bring up that comes to mind, it could be Daniel Ponce De Leon facing off with Adrien Broner in March of 2011 back when the Cincinatti fighter was undefeated and still in his early 20’s, much like Davis. Ponce De Leon lost a decision that night, but not without giving a solid account of himself and making an awkward fight for young Broner. Perhaps Cuellar can must up all of his championship experience and come through on this night. It appears to be an uphill battle, but not without reach. Who Could and Should Anthony Joshua Face Next?